Decorating with antique tractor pictures is a great way to appreciate the beauty of these amazing pieces of machinery. Collecting real antique tractors can be quite costly, and requires more storage space than most people have. Many fans of rustic farm equipment settle for surrounding themselves with pictures and visiting events where they get to see the equipment in action. Many people who appreciate the beauty and innovation of rustic agricultural equipment enjoy collecting and decorating their homes with images of antique tractors. Whether you prefer vintage photographs, original paintings or modern prints suitable for framing, there are many resources where you can find collectible artwork to add to your display. eBay is an excellent resource for locating new and vintage antique tractor artwork. Products offered for sale change frequently, so check back often to make sure you don't miss the opportunity to bid on a perfect addition to your collection. Meg's Art World carries a complete series of more than 35 different, limited edition Russell Sonnenberg prints that depict antique tractors in use. Both framed and unframed images are available. Artist Michael Ross Matherly has created an impressive collection of paintings depicting antique tractors in appropriate settings. Original paintings and signed prints may be ordered through Matherly's website. 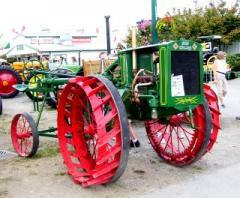 Farm and tractor shows and festivals are great resources for locating pictures to add to your collection. Check the Farm Collectors Show Directory to find out the details of events in your part of the country. Vendors who specialize in selling agricultural collectibles tend to set up booths at special events around the country. Your local antique shops are also excellent resources for locating collectible pictures. Get to know a few antique dealers or the owner of a local antique mall. Once professional antiquarians know that you're in the market for images of antique tractors, they'll be more than happy to work on locating items for you to purchase. Café Press offers collectors a unique take on antique tractor images. The company can imprint various items with stock tractor pictures. You can order a mouse pad, mug, clock, t-shirt and many other items adorned with an image of a vintage or modern tractor. Because there are so many different types of antique tractors, it isn't feasible to display pictures of every model in your home. However, you don't have to own a particular image in order to enjoy looking at it. There are many online resources for viewing thousands of pictures featuring antique farm machinery from around the world. 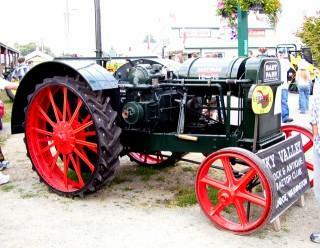 Antique Tractors.com: You can view nearly 3,000 photographs of antique tractors on this website. If you'd like to contribute to the gallery, you can upload your own pictures as well. Yesterday's Tractor Company: This website has more than 22,000 antique tractor pictures that users can view. You can also upload your own photos if you'd like to add them to the collection. Antique Tractor Bible: The Complete Guide to Buying, Using and Restoring Old Farm Tractors by Spencer Yost is an interesting read and has great shots of antique tractor equipment. Leeds and Gordon Mills in Chickamauga, Georgia has an antique tractor museum that collectors will likely enjoy touring. The Virginia Tractor Museum is located just outside Richmond, and features hundreds of antique tractors and other farming equipment. For collectors, a large part of the joy of the hobby lies in the thrill of the hunt. You'll have a great time looking for antique tractor pictures to add to your collection.